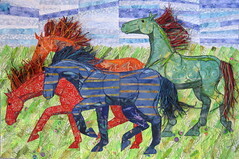 I was surprised at how much work remained after the last square was finished – there was some engineering involved to get the pieces to come together and stay together, some additional stitching to smooth some of the lines across the junctions, and all those manes and tails. I didn’t like working on one piece at a time because I wanted the piece to fit together better than it did. I could have used more different fabrics across the entire piece. This makes it quite unified, but then I wonder why I bothered to cut it into smaller pieces to begin with. I like the stitching as a sketching line as well as a fixing/finishing line. I like the way the manes and tails came out. I had this colored hemp from a different project and the colors fit perfectly! Were I to do something like this again, I would use someone else’s artwork, make less than 16 pieces, and expand my repertoire of techniques. Now, what was March going to be again? this is beautiful! I can’t figure out what you’re whining about? I know, I know, its that think in us that says, hmmmm if only I’d….. I got cranky working on it, and I am sorry to whine – it isn’t whiny so much as thinking aloud, I think? i like the way you have broken down your analysis into little pieces. it works well with the project and i think it is great to share thoughts like this. whining was the only word I could think of when I was typing, probaby better to use thinking out loud as you say. but my intent was to sympathize with you about not ever being quite the way we want it to be even though to others it looks fabulous. I’m so impressed with the way you seem to have designed this. I don’t think my horses would be put together so well. I’d probably have arses in the wrong place or noses just enough out of alignment to look wonky. Bravo! I love it. Thank you so much for sharing this process with us. Your piece looks great… It turned out wonderful!